Are NSAIDs bad for rugby players? We all know how tough rugby is on the athlete’s body. And how sore you can be when you wake up the next day, especially when there’s travel involved. If you’re an amateur player, there’s very little chance you’ve got a physiotherapist on hand for post-match rub downs or the facilities for contrast baths. So many amateur players, myself included, have resorted to taking non-steroidal anti-inflammatory drugs (NSAIDs) in the minutes, hours and days after a rugby game. It makes sense. Your body hurts, your joints and muscles swell and you’re looking for something to take the pain away. So the idea of slamming a bunch of pills as a catch-all solution for muscle soreness is highly attractive. The most common NSAIDs are aspirin and the more popular ibuprofen. Given the limited time and resources that amateur players have for recovery, it’s perfectly understandable to see people passing around the ibuprofen tablets in the changing rooms after a game. They’re almost like currency if it’s been a particularly tough match. But is taking ibuprofen immediately after rugby games and training the best way to accelerate recovery and reduce muscle soreness? 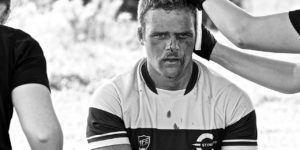 Rugby players have a love affair with ibuprofen that goes back many decades now. You can see this in the way we talk about the drug. It’s almost as if we can’t live without it. And yet, do any of us really know what NSAIDs like ibuprofen are doing to our bodies and the risks associated with the long-term use of these drugs? Your nervous systems contains specialized pain receptors called nociceptors that stretch from your spinal cord to your skin, muscles, joints, teeth and some of your internal organs. Unlike other nerve cells which transmit information about sensations, nociceptors only fire if something happens that could cause or is causing pain. So if someone pokes your shoulder, your regular nerve cells fire. While if someone punches your shoulder, your nociceptors fire. Everyone’s nociceptors fire at different levels of damage, which translates to different pain thresholds across individuals. When cells are damaged, they release a class of chemicals called Prostaglandins, like arachidonic acid, which is then converted into Prostaglandin H2 by the enzymes COX-1 and COX-2. Prostaglandin H2 is then broken down into other chemicals that cause inflammation and lower your pain threshold by changing the point at which your nociceptors fire. Ibuprofen and Aspirin work slightly differently, but they have similar effects by blocking COX-1 and COX-2 from producing Prostaglandin H2. Without Prostaglandin H2, your body is unable to create localized inflammation at the site of injury. This is why ibuprofen and Aspirin are known as over-the-counter anti-inflammatories. So when you’re taking Ibuprofen, what you’re really doing is changing your pain threshold by blocking the chemicals that would tell your brain that you have an injury. And at the same time, you’re preventing inflammation caused by the breakdown of Prostaglandin H2. How do rugby players use NSAIDs? There are 3 common ways ibuprofen and aspirin are used in rugby circles. Let’s get this out of the way early, there is nothing wrong with using ibuprofen or other over the counter NSAIDs to prevent swelling in joints if you have a legitimate injury like a broken leg or a torn ACL. Always follow the advice of medical professionals, who may prefer to prescribe you something even stronger for the same purpose. Naproxen is one of the most common prescription NSAIDs, which many of us probably have floating around in our medicine cabinets after the last time we were told not to play for a month. But what about the other use cases? What about if we want to prevent inflammation after rugby games or prevent pain during them? This is the most common application for NSAIDs, particularly amongst amateur rugby players. We use it semi-religiously to prevent muscle soreness and inflammation after grueling rugby games. The problem? As we outlined in the sciency stuff, NSAIDs aren’t actually designed to improve recovery. The drugs are reduce inflammation and raise the pain threshold, but neither of these things will actually help your body repair tissues. In addition, NSAIDs are diffuse treatments for focal inflammation. When your shoulder swells, you take ibuprofen. When your head swells, you take aspirin. But NSAIDs don’t know that it’s your head that’s swelling up. They act on your body uniformly be reducing inflammation through your entire system. To put this in context, we can compare it to hypothermic treatment. If you break your finger, you don’t submerge your entire body, toe to head, in an ice bath. No, you put an ice pack on your hand to get the swelling out of your fingers. When we take NSAIDs after rugby games, we are making a big assumption – that inflammation is bad and we need to prevent it. The problem with this assumption is that it doesn’t consider the positive effects of inflammation on the body’s natural recovery processes. We need swelling. We need it for the growth and repair of muscle fibers. One study on the effects of Ibuprofen on skeletal muscle showed that taking ibuprofen during endurance training canceled running-distance-dependent adaptations in skeletal muscle. Another study confirmed in the laboratory that the use of NSAIDs after exercise slowed the healing of muscles, tissues, ligaments and bones. In fact, previous research suggests that treatment with ibuprofen can reduce muscle hypertrophy by almost 50 percent, which means that taking a COX inhibitor may very well be counterproductive for muscle gains. While perhaps the least common, the prophylactic use of NSAIDs is potentially the most dangerous. If you are carrying an injury into a rugby game, the risk of re-injury is greatly increased. This goes for muscular, ligament, bone or head injuries. If it’s an important game, significant social pressure can be placed on players to simply muscle-up, take a bunch of pills and get out there on the rugby field. Unfortunately, this often goes against medical advice for the long-term health of the individual player. It’s interesting to note that pain is one of the few things that athletes are actually allowed to mitigate through the use of drugs. While the W.A.D.A isn’t ok with us slamming down anabolic growth agents, they are perfectly fine with the use of over the counter NSAIDs. Approximately ¼ of athletes at the Sydney Olympics tested positive for NSAIDs in 2000. While as many as 10% of soccer players use drugs like ibuprofen before every match. The reason given for pre-emptive use of NSAIDs in high-school level American football players is the perceived benefit in terms of blocking pain before it occurs. Sounds good, right? NSAIDs reduce pain and reduces swelling, so what’s the problem? Recent studies have shown that the long-term use of drugs like ibuprofen can have a range of associated risks. These risks include damage to internal organs, over-reliance on the drug, negative effects on muscular hypertrophy and allowing for return to play before full recovery resulting in re-injury. What does all that mean? If you use ibuprofen and apsirin regularly, you risk serious damage to your heart, kidneys, stomach, and brain. The more of the NSAID you use and the longer you use it for, the worse the damage can be. Ok, I can hear you thinking, well that’s damage as a result of long-term use. That doesn’t necessarily mean you shouldn’t take ibuprofen after rugby games, it just means you shouldn’t take too much. Unfortunately, as Warden goes on to explain, the use of NSAIDs can actually delay healing, impair muscle growth, and potentially encourage re-injury. By inhibiting COX isozymes and prostaglandins, NSAIDs impede synthesis of collagen which gives your muscles strength. This interferes with the adaptation of connective tissues and can predispose you to future injury. Prolonged use of ibuprofen specifically reduces the rate of tissue repair on both a micro and macro level – this is most severe in bones but the same delay can be seen in healing of acute ligament, muscle and tendon injuries. Swelling is a major obstacle to recovery for many injuries. In some cases it can even be an obstacle to diagnosis, since modern medical imaging of a joint is sometimes only possible once swelling has subsided. Without the use of NSAIDs, swelling can take weeks or months to settle, even when hypothermic and compression treatment are applied. But swelling has purpose in recovery. The body doesn’t just do it for fun. Our joints swell during injury specifically to prevent movement and give the body time to repair the tissues involved. The risk associated with using ibuprofen to prevent pain and inflammation is that you may not be able to accurately determine when the injury has fully healed. This could mean you’re back on the rugby field carrying an injury which greatly increases the risk of re-injury. Do you need an NSAID? While it is tempting to use NSAIDs when you get off the rugby field, the associated risks should be understood before you take any over-the-counter medication. In particular, we do not recommend the use of NSAIDs like ibuprofen before rugby games to prevent pain as this can greatly increase your risk of serious and long-term injury. Don’t forget to check back on Wednesday, when we’ll have a follow up article titled: When should rugby players use ibuprofen? – stay tuned!! Absolutely Broken – When to retire from Rugby?